Excusez moi. It may occupy a pretty small space at Icon Village, but don't overlook it. 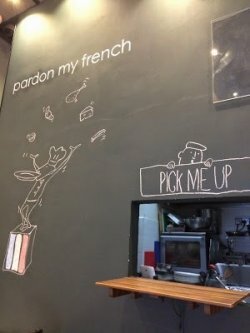 Opened by 2 At-Sunrice Global Academy graduates, Pardon My French serves up French cuisine without frills. What differentiates this casual French bistro-cafe is that the 2 chefs make a lot of their things from scratch and inject their own interpretations to the dishes. Homecured duck confit; homemade shoestring fries, homemade baileys ice cream...you get the idea. 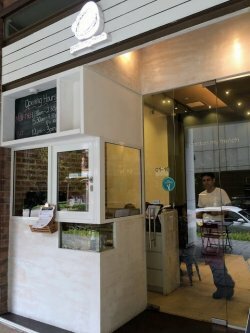 Their lunch sets are priced at $8.90 (main + soft drink) and $12.90 (main + dessert). Dinner mains range from $12 for pastas to a just a little over $20 for others. 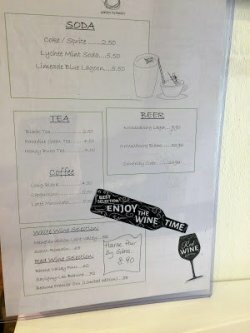 They change up their lunch menu from time to time and these changes are updated on their Facebook page. 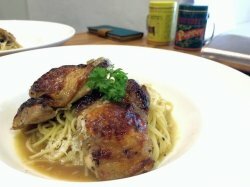 Poulet Roti with pasta ($12.90 lunch set with dessert)The roasted poulet roti of chicken thigh was flavourfully marinated and moist . Together with the al dente pasta tossed in caramelised onions sauce, this was on pointe. 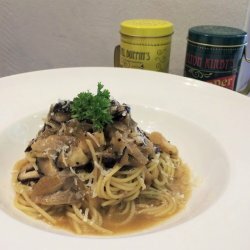 The mushroom pasta was also tossed in the same caramelised onions base sauce. Similar to the poulet roti, just without the chicken and with juicy mushrooms. Homemade Baileys Ice Cream (eggless) with Ruby Poached Pear ($6)We had the Ruby Poached Pear, which came with homemade Baileys Ice Cream (eggless). The red poached texture of the pear was tender yet still supple, without being mushy. 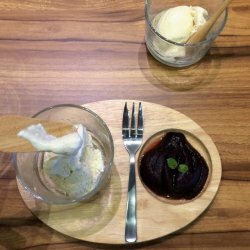 I am not much of a fan of red wine in food, but the red wine aftertaste of the poached pear was a likeable thick-velvety without being overpowering. The star though was the homemade Baileys Ice cream. It was the right balance of sweet and Baileys alcoholic flavour and creaminess. This made one of my favourite, if not my most favourite, versions of this ice cream. 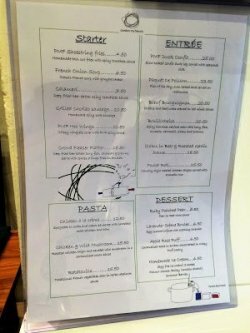 The menu creations have been tweaked for local palates, so it may not be for those who are looking for authenticity, but it certainly might be better for your waistline (less salty homecured duck confit anyone?) and definitely suitable those who aren't fans of the creaminess and richness of French flavours. Go during lunch time, when the sets are even more value for money. It's good for small groups/dates, especially given the quiet ambience since it is as yet a secret. Now the secret's out. Oh no. Bon appetit.